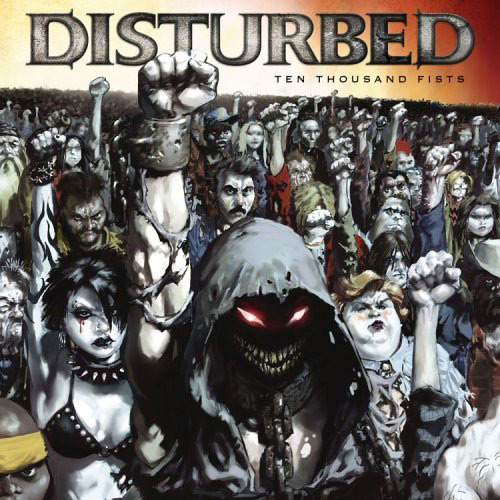 Ten Thousand Fists is the third studio album by Disturbed. With the popularity of nu metal rapidly declining most bands in the subgenre chose to take another path and Disturbed are no exception to this as they embrace a sound that is somewhere between hard rock and traditional heavy metal for Ten Thousand Fists. With the musicianship of drummer Mike Wengren and guitarist Dan Donegan being heavily contained on Disturbed’s nu metal albums for the most part, Ten Thousand Fists makes its evident that they want to do more or at the least get back to the level that they were at when playing groove metal under the name Brawl. The songs are faster, sound more powerful and for the first time there are guitar solos to be heard on several songs including Stricken, Overburdened, Forgiven, Avarice and Land of Confusion, an unexpected cover of a Genesis song that translates exceptionally well into their new sound. There aren’t any weak songs to be found per se but after a few listens it can start to sound a bit played out due to the lack of variety, which isn’t helped by a 56 minute running time and it seems hard trying to justify the length of it for this reason. David Draiman’s vocals are as strong as ever and on I’m Alive he cleverly enunciates the words rage and anger when he sings “change again, cannot be considered/I rage again, dispelling my anger” for effect without having to resort to shouting. However his trademark barking noise from The Sickness make an appearance on the title track, Sons of Plunder, Forgiven and Avarice but is absent from most songs. His lyrical themes have now progressed onto topics such as war and personal struggles with Decadence addressing self harm and I’m Alive dealing with the pressure of others trying to influence the bands artistic direction to create something that wouldn’t be Disturbed and their subsequent rejection of this. Overburdened looks at people killing others in the name of religion or political ideology only to finding themselves queueing up to enter Hell, which is overburdened by the sheer number of people caught up in harmful ideology all while thinking that they’re fighting for a righteous cause. At the start of the song one of these people reflects on this by saying “Fate is so unkind/Now I should have known/Blind leading the blind/Reaping what I’ve sown/If it all amounts to nothing/Why, then, am I standing in this line?” after believing that they were right in doing what they did. David Draiman puts a different lens on this perspective to infer that “holy blessed homicide” is wrong in any context and that people that believe otherwise have been misled, possibly for the gain of others. The improved musicianship and deeper lyrical content that has come with the change in sound will surely have won over some new fans and there are many infectious hooks that will get stuck in your head for days after hearing them but on repeated listens some songs will start to wear thin due to the rank and file nature of the album.